The FT-1900R provides a hefty 55 Watts of power output, with "low power" settings of 25, 10, and 5 Watts, for situations where full power is not required. The FT-1900R packs 3W BIG watts of Loud Audio with its own Internal Speaker for those noisy environments. The FT-1900R provides receiver coverage of 136-174 MHz, so you can listen in on a wide variety of commercial, military, public safety, and marine communications. The supplied MH-48a6j DTMF Microphone is illuminated for ease of nighttime use, and you may enter operating frequencies directly from the keypad. What's more, memory channels may also be recalled directly via the keypad. The FT-1900's extensive memory system includes 200 regular memories, ten pairs of band-limit memories, 8 memory banks, and a one-touch "Home" channel. Memory channels store repeater offset information, as well as CTCSS or DCS data, and can have a six-character label appended, for quick channel recognition. And the memories may be allocated into as many as eight memory banks, for more efficient scanning. Included in the FT-1900r is a dedicated, quick-access memory bank that contains the ten standard NOAA Weather Information Channels, so you can keep track of weather conditions expected for your area. Four user-programmable "soft" keys are provided on the MH-48a6j microphone, allowing you to bring often-used Menu items, or front panel key functions, to your fingertips. The FT-1900R includes both CTCSS and DCS Encoder/Decoder circuitry, with Reverse CTCSS Decoding also available, to mute your receiver when a particular tone is received (instead of opening your squelch). And you can encode CTCSS and decode DCS, or vice versa, too, if your application requires it. The microphone gain for the FT-1900R's transmitter is adjustable, so you can optimize it for your voice level as well as background noise in your operating location. And for operation in crowded channel environments, the TX deviation and RX bandwidth may both be reduced via the Menu. ARS: Automatically selects the typical repeater shift used in your country, based on the current operating frequency. APO: Automatically turns power off after a user-defined time period, to prevent you from running down your car battery if you forget to turn your rig off. BCLO: Prevents you from transmitting on an occupied frequency (especially valuable during Tone Squelch or DCS operation). You can practice your Morse Code recognition, using this novel trainer that sends you five-character code groups, with variable speed and instant feedback as to the correct characters sent to you. A defeatable (by the owner) Security Password system is provided for the FT-1900R, so you can limit operational access to yourself and any other users (if any) informed of the password for the transceiver. Estimating the value of a rig can be challenging. 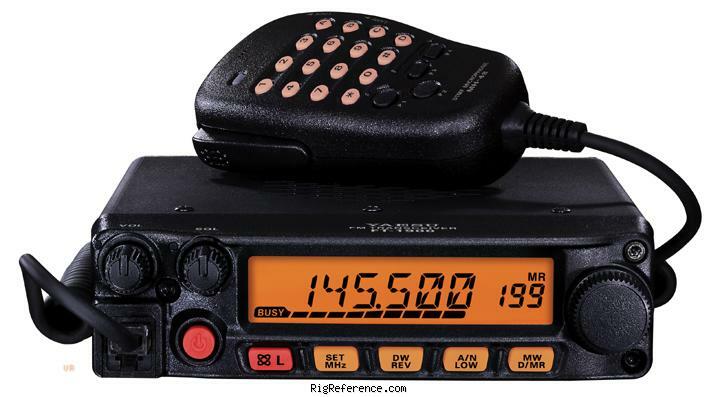 We collect prices paid by real hams over the years to help you estimate the current value of the Yaesu FT-1900R. Just bought or sold this model? Let us know what you traded it for and help other ham operators!